पुस्तक का विवरण : राष्ट्र-भाषा हिंदी की गौरव-वृध्दि के लिए जहाँ आधुनिक विषयों पर उच्च कोटि के नवीन ग्रंथों के प्रकाशन की आवश्यकता है, वहां प्राचीन साहित्य, दर्शन आदि के सर्वोत्तम ग्रंथों को हिंदी-पाठकों तक पहुँचाना भी आवश्यक है| इसी दृष्टि से संस्कृत साहित्य-शास्त्र के इस महत्वपूर्ण ग्रन्थ ‘ध्वन्यालोक’ की यह विस्तृत हिंदी व्याख्या प्रस्तुत की जा रही है| ‘ध्वन्यालोक’ काव्य-दर्शन का ग्रन्थ है………….. Description about eBook : For the glorification of Nation-language Hindi, where the need for publication of high quality new texts on modern subjects, it is also necessary to send the best texts of ancient literature, philosophy etc. to Hindi-readers. 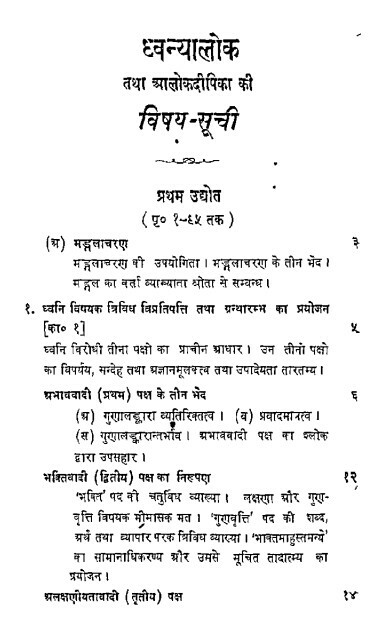 From this point of view, this detailed Hindi interpretation of this important text of ‘Dhwanyalok’ is being presented. ‘dhwanyalok’ is the text of poetry-philosophy………………..